Loyalist Township Business Burt's Greenhouses wins Second regional Premier's Award for Agri-Food Innovation Excellence. 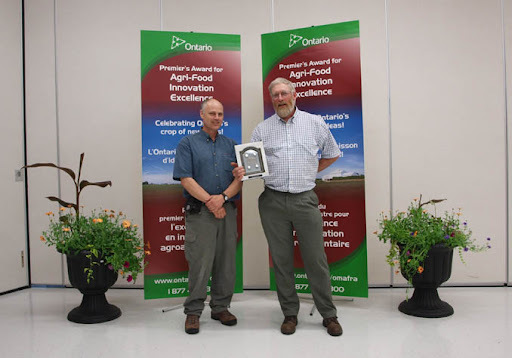 On Friday May 28 in an award ceremony in Brighton Burt's Greenhouses received a regional Premier's Award for Agri-Food Innovation Excellence. The award was related to the work done at Burt's Greenhouses to modify their Biomass Combustion heating system to make it more efficient and less polluting. In addition Burt's have recently been conducting experiments in the manufacture of Biochar with their system. Biochar is a product of a specialized combustion process that results in about 50% of the carbon in the wood remaining fixed. The Biochar can then be used as a soil amendment that is highly resistant to breaking down in the soil thus sequestering the carbon in the soil for centuries to come. Burt's greenhouses are a progressive grower of bedding plants, perennials and shrubs in the Kingston area. They were established in 1981 by Ruth Hayward and Brian Burt. They grow at their location near Odessa and sell there as well as several satellite garden centres located in Kingston, Napanee and Belleville. Over the years Burt's have had a reputation for being first adopters and innovators in the greenhouse industry. In 2007 Burt's received their first regional Premier's Award for Agri-Food Innovation Excellence. That award was related to a unique system of "hot beds" that allow plants to be grown out of doors but still be protected from the extremes of temperature they could experience on cold spring nights. Both of these awards show Burt's Greenhouses commitment to reducing their carbon footprint. The greenhouse industry is a heavy user of fossil fuels but with the biomass heating system the heating can become close to carbon neutral. As the Biochar work advances it is hoped that Burt's operation will actually become carbon negative.